Generally speaking, the exhibition and preseason contests are a time to work out some kinks and get into the flow of a new season. For the Cowgirls, these games are a vital precursor before delving into the dangerous Big 12 slate of games. So when the ladies in orange took to the court, one lady was noticeably absent for her tune-up – Toni Young. She was out with the team before the game, wearing a gray sweatsuit and her street sneakers, while the others were in their black with orange accented warmups over the uniform proudly representing Oklahoma State University. She listened in huddles, from the back of the pack. But she most certainly didn’t touch a basketball. Young, a junior for the Cowgirls, is recovering from a broken arm suffered while dunking in practice just prior to OSU’s loss to Wyoming in the 2011 WNIT tournament. The Del City product is not necessarily missing due to her recuperation, even though Budke acknowledged her slow recovery at OSU’s media day. He noted that the team might hold her out to get healthy, so she could “play like the Toni Young we saw last spring”. But instead of this being a cautionary benching, she is missing for this game – and will also miss three more – due to a suspension levied by the Cowgirls’ head man. Budke called her infraction a “violation of team policies”. The next three games that Young will be missing are all home contests, as the Cowgirls host Rice, Grambling State and Texas-Arlington before the Thanksgiving holiday. Coppin State is the Saturday following and if all goes to plan, she would be available to see playing time on Nov. 26, if Budke sees the need to get her minutes. The Cowgirls squeaked by Fort Hays State by the tally of 51-55 in Young’s absence, due in no small part to general shooting malaise throughout the game including a dismal 7-of-28 in the second half. OSU was outrebounded 46-41 and allowed the Tigers to stick around with five second half three-pointers and nine in the game. The contest was tied as late as 1:30 remaining on the clock. 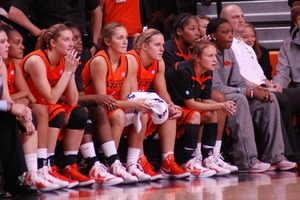 OSU was led by junior Lindsey Keller’s 14 points and seven rebounds. Kendra Suttles added 12 points, nine rebounds and four steals for OSU while fellow sophomore Vicky McIntyre chipped in 12 points and posted five blocks. Tiffany Bias finished with seven points, eight assists and six steals, including a clutch final minute that helped the Cowgirls to the win. “What you saw at the end is I just kind of went with what we call a veteran group right now and I went with I think it was maybe four sophomores and a junior or something like that,” Budke said. “It’s still a pretty young team to try and win that ballgame. Young, one of four juniors on a senior-less squad, should be in that veteran group if she does that growing up Budke alluded to. She was named to the preseason all-Big 12 team is coming off a season that saw her rack up 15.5 points and a league-high 9.1 rebounds a night. She’s climbing up the O State charts as a prolific shot blocker – she sits in sixth but just needs two to move up to No. 4. After breaking the 500 mark last year, Young is 17th for career rebounds and needs 64 more to crack the Top 10. She amassed 14 double-doubles as a sophomore, good for third in the OSU single-season record books. Young is seventh on the all-time list, and just needs four to move up a spot. But when she’ll get those four – or even when she’ll see the floor – is now in question.